I'd have a lot of anxiety and would panic working in a space like that. My health would suffer too!! Two monitors and three lamps!? Why three? Mildred: Yes, anxiety and panic are what my wife feels every time she walks into my office! She's a neatnik and would be mortified if I ever told her a photo of my office is on the internet! Kenju: The third lamp on the left is also used at a reading desk that's not seen in the photo. Of course, it's piled so high I can't use it! I'd like to keep a cleaner work area, but if I straightened up I couldn't find anything. 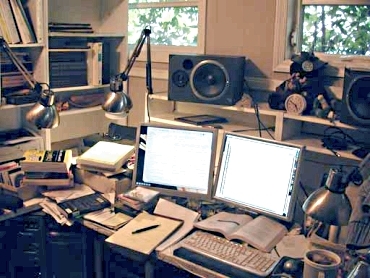 I have to admit that I've never kept a neat desk, but it's a bit more chaotic than normal due to the concentrated work I've been doing lately. Fortunately, I have the room to myself and we can just close the door. Ooh, two monitors. I'd love to have two monitors! Your space looks like my husband's half of the office. Yes, mine grows to look like this, then every two weeks I have a fit and shovel the surfaces clean. This lasts five minutes, but I feel heroic. :) Glad to meetcha. Aw, you just look like a busy guy! But I'd want to clean up that reading desk so I could use it. I don't like to have potentially usable space stacked with obstacles. There was just a discussion going on over at Unclutterer about messy vs. clean workspaces. You might want to take a look. ell: I've used two monitors for years, and now I can't work without them. The one on the right to write, the one on the left for reference material. Mage: Glad to meetcha, too! A shovel to clean mine is too small. I need a backhoe! Cynthia: Thanks for the tip. I've read about half, going back to read the rest. Finally! A blogging space I would feel right at home in!! My wife complains about my 'clutter.' However, when ahe asks for a paper, I know exactly where in the stack(s) it's located, and that always amazes her. Putting it back is another challenge, however. I need a secretary....! !